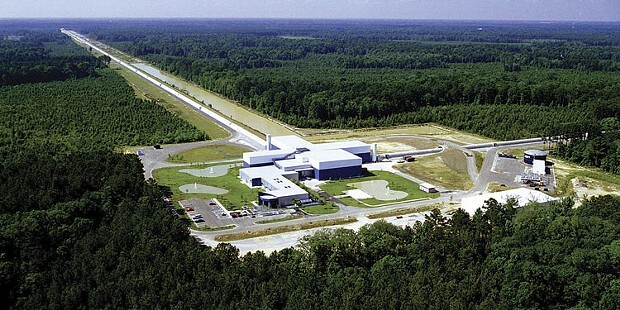 The two 2.5-mile-long arms of the LIGO instruments (this one is in Louisiana) allow detection of gravitational "ripples" that cause miniscule changes in their lengths. For as long as our kind has looked up at night, all our information about the universe has come from electromagnetic waves: mainly visible light (amplified by telescopes since Galileo's time), infrared and ultraviolet light and, more recently, radio waves. That is, until 5:51 a.m. Eastern time on Sept. 14, 2015, when a half-second "chirp" from gravitational waves was detected, first in Livingston, Louisiana, and then, seven milliseconds later, 2,000 miles away in Hanford, Washington. To say that the signal was weak is an understatement. Gravitational waves, predicted by Albert Einstein 100 years ago, are so faint that scientists have to employ heroic means to detect them. The effort took 40 years, cost $1.3 billion (thanks National Science Foundation!) and involved over 1,000 collaborators worldwide. The Louisiana and Washington detectors, jointly called the Laser Interferometer Gravitational-wave Observatory (LIGO) each consist of two 2.5-mile-long arms at right angles to each other. Twin megawatt beams of infrared laser light are sent down vacuum tubes in the arms, reflected by mirrors (multiple times) and then compared for consistency. Normally nothing is seen, because the beams are perfectly "out of phase" and cancel each other out. When a gravity wave passes by, however, one arm slightly lengthens compared with the other, allowing it to be detected. How slightly? There's the rub. Gravitational waves stretch and squeeze space by only about one part in 10^21. Detecting them is equivalent to measuring the distance to Alpha Proxima — the closest nighttime star — to an accuracy the width of a human hair. (Just writing that makes the hairs on the back of my neck tingle.) Which is why LIGO needs two instruments, since a plane overhead or even a cough in the control room can fool the ultra-sensitive detectors. However, the odds are stacked against simultaneous local noise occurring at opposite ends of the country. So what did the twin LIGO instruments see two years ago? A collision of two black holes, each about 30 times the mass of the sun, that occurred 1.3 billion years ago. Since black holes emit no light or radio waves, the only way we can directly "view" them is via gravity waves. As often happens with scientific discoveries, there was a serendipity factor: The LIGO instruments weren't even fully up and running mid-September two years ago, and would have been turned off for maintenance three days earlier but for a combination of fortuitous circumstances. So here's this half-second long ripple of a gravity wave radiating at the speed of light through nearly-empty space for over a billion years, and right when it passed by Earth, we just happened to have — for the first time ever — the means to detect it. Since then, LIGO has "seen" at least four more black hole collisions, none as strong as the original event. The future looks rosy for a new era of astronomy, now that, metaphorically speaking, we have ears to listen to the universe where previously we could only see it with our eyes. Typically, the Nobel physics prize is awarded a decade or more after the announcement of a groundbreaking achievement. This year, however, the Nobel committee acted with unprecedented speed, awarding the 2017 prize to three of the architects and leaders of LIGO: physicist and laser-interferometer pioneer Rai Weiss of Massachusetts Institute of Technology, gravity-theorist Kip Thorne of California Institute of Technology and "Big Science" experimental physicist Barry Barish of California Institute of Technology. The committee noted that the detection of gravitational waves was "a discovery that shook the world." In this case, that's no metaphor. Barry Evans (barryevans9@yahoo.com) marvels at the sound of the original half-second LIGO detection. 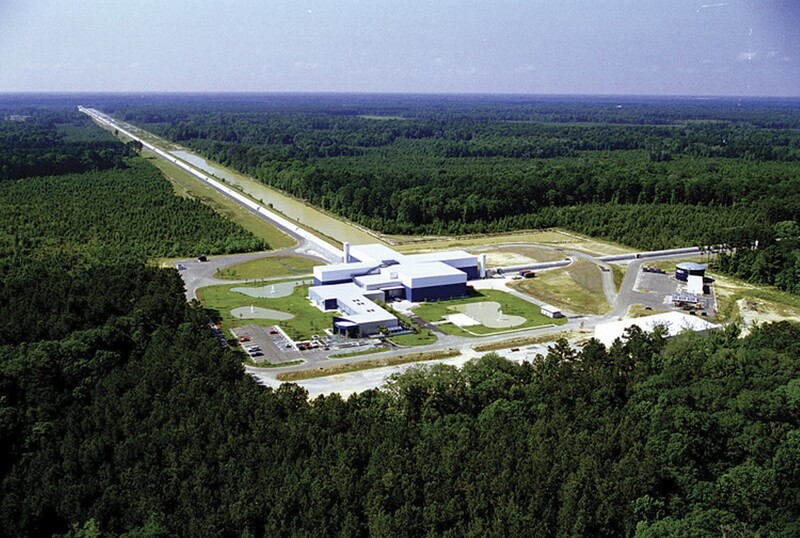 You can hear it on the YouTube video "Listen to the sound of Gravitational Waves (LIGO)."